Bacterial infection of eggs; Pathogen contamination risks in poultry as a risk to human health; Detecting and controlling veterinary drug residues in poultry; Modelling risks from antibiotic and other residues in poultry and eggs; Pathogen population on poultry farms; Catching, transporting and lairage of live poultry; Ensuring the safety of poultry feed; The effective control of hazards in Swedish poultry: the case for Sweden; The use of probiotics to control pathogens in poultry; The HACCP concept and its application in primary production; Microbial risk assessment in poultry production and processing; Techniques for reducing pathogens in eggs; Improving slaughter and processing technologies; Refrigeration and the safety of poultry meat; Sanitation in poultry processing; HACCP in poultry processing; On-line physical methods for decontaminating poultry meat; Microbial treatments to reduced pathogens in poultry and poultry meat; Irradiation of poultry meat; Rapid detection and enumeration of pathogens on poultry meat; Modified atmosphere packaging and the safety of poultry meat; Handling poultry and eggs in the kitchen. The safety of poultry meat and eggs continues to be a major concern for consumers. As a result, there has been a wealth of research on identifying and controlling hazards at all stages in the supply chain. Food safety control in the poultry industry summarises this research and its implications for all those involved in supplying and marketing poultry products. The book begins by analysing the main hazards affecting poultry meat and eggs, both biological and chemical. It then discusses methods for controlling these hazards at different stages, from the farm through slaughter and carcass processing operations to consumer handling of poultry products. Further chapters review established and emerging techniques for decontaminating eggs or processed carcasses, from physical methods to the use of bacteriophage and bacteriocins. 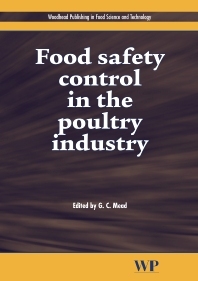 With its distinguished editor and international team of contributors, Food safety control in the poultry industry is a standard reference for both academics and food companies.